You can never be too prepared when it comes to learning about snakes. 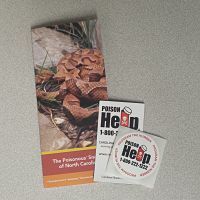 Order your FREE snake pack, which includes our in-depth guide to the venomous snakes in North Carolina, a “Program-the-Number” sticker, and a poison control magnet. Calling the poison control center in the event of a snake bite may be the best first-aid step you take.